The Turkish government has proposed a new law which will ban the use of the words and terms “Kurdistan”, “Kurdish city/cities” and “Armenian Genocide” in parliament. Parliamentarians who use these words or terms will be fined 12,000 Turkish liras (about $4500) and be banned from participating in three sessions in the Grand Assembly. Carrying placards, which opposition parties often do to criticise the ruling Justice and Development Party (AKP) government, will also be banned. Thousands of people demonstrated in London on November 6 in the latest protest against the mass arrests of pro-Kurdish politicians in Turkey. On November 4, the regime of Turkish President Recep Tayyip Erdoğan issued arrest warrants for all 59 MPs from the Peoples' Democratic Party (HDP), a left-wing largely Kurdish-led party. About 80 people rallied outside the Turkish consulate in Melbourne on May 25 to condemn the massacre of Kurds and support the People's Democratic Party (HDP) MPs now facing prosecution by the Recep Tayyip Erdogan government. On September 12, hundreds of people marched in Melbourne, Sydney and Perth against the Turkish state under president Recep Tayyip Erdogan waging war on the Kurdish people. 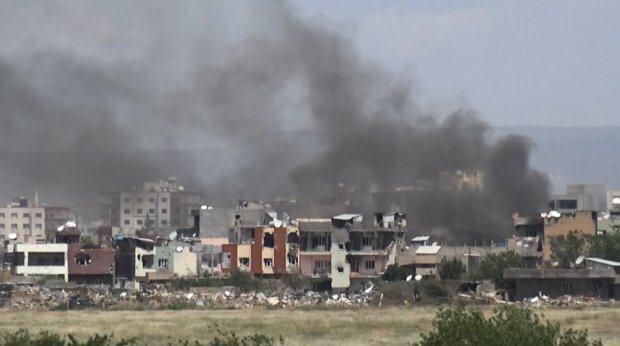 In the last month, severe clashes have taken place in many Kurdish cities, including Silopi, Lice, Şemdinli, Silvan, Yuksekova and Cizre, where civilians have been targeted by state forces. Tens of civilians, guerrillas and members of state security forces have died in the ensuing clashes. Socialist Alliance’s Dave Holmes gave this speech at the Melbourne rally. In the June 7 Turkish elections, President Recep Tayyip Erdogan's Justice and Development Party (AKP), which has ruled Turkey since 2002, won the largest vote and share of the new parliament – 258 of the 550 seats. But in a dramatic rise in its vote, the left-wing People's Democratic Party (HDP) came equal third, winning 80 seats.